People who love to eat beef or pork often face a dilemma. While people from the meat industry promote lean red meat as a heart friendly diet, studies show that consuming it is associated with heart diseases and cancers. So what exactly is the truth? Are there any benefits in eating red meat or is it better not eaten has been a long standing debate. Among the claims and counter claims made by people on either side of the debate, it is the common man who is left a confused soul. In this article, I have tried to incorporate both the advantages and the disadvantages of consuming red meat for the benefit of the readers. Let us first begin with the advantages of eating red meat since they are seldom highlighted. Red meat is a very good source of protein which is so essential for the building of bones and muscles. Red meat is an excellent source of heme iron. This form of iron is readily absorbed by the body and can be extremely good for patients suffering from iron deficiency anemia. Girls and women of child bearing age are often anemic because of loss of blood during menstrual cycles. Consumption of red meat loaded with heme iron may be of great help to them. Red meat is also rich in vitamin B12, a vitamin required for the production of DNA. Besides, vitamin B12 is also essential for maintaining the red blood cells in a good health. Red meat contains sufficient quantities of zinc which is so important for the proper working of the immune system. In fact, red meat is among the best nutrient dense foods. According to Shalene McNeil, PhD, executive director of nutrition research for the National Cattlemen’s Beef Association, a one ounce serving of lean beef provides 10 essential nutrients while containing just 180 calories. If the red meat is so good then why do physicians discourage us from eating it on a regular basis? This is because red meat is loaded with saturated fats which increase the blood cholesterol levels. High cholesterol is the main reason behind multiple cardiovascular diseases. Apart from diseases of the heart, red meat consumption has been associated with the development of many types of cancers. While its link with colorectal cancer has been established by many studies, there are evidences to show red meat being linked to lung, esophageal, pancreatic, stomach and endometrial cancers as well. After reviewing the results of multiple scientific studies, an expert panel comprising members from the World Cancer Research Fund and the American Institute for Cancer Research came to a conclusion in 2007 that red meat or processed meats are convincing or probable sources of the above mentioned cancers. 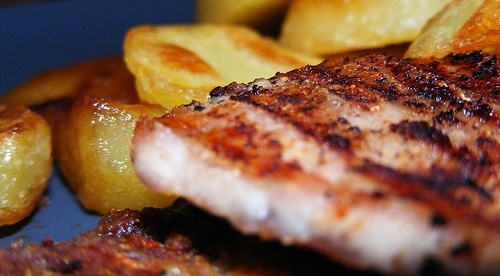 “Eating Less Red Meat Could Benefit Health and Environment, Study Suggests”, published in the September (, 2012 issue of Huffington Post, accessed on November 20, 2012. “The Truth about Red Meat”, by Elizabeth Lee, published on the WebMD site, accessed on November 20, 2012. “Red Meat Consumption and Mortality Results From 2 Prospective Cohort Studies”, by An Pan, et al, published in the April 9, 2012 issue of the Archives of Internal Medicine, accessed on November 20, 2012.